Esho lives in the suburbs of Kyoto, the center of traditional Japanese culture. He was born in a mountainous town in Hiroshima Prefecture and studied at National Fishery University in Yamaguchi Prefecture, Ryukoku University in Kyoto, and the University of Hawaii in Honolulu. He also spent about one year in Cambridge, Massachusetts, where he studied new American religions at Harvard Extension, and five weeks at Beijing University, where he took an intensive Chinese course. The other countries he has visited include India, Pakistan, Afghanistan, the United Kingdom, Germany, Belgium, and Canada. 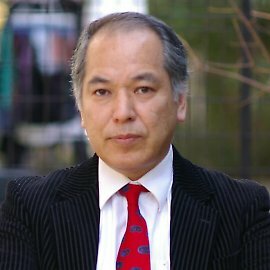 After obtaining two master's degrees (in religion and Buddhism), he worked for many years at a private university in Kyoto, serving as a staff member in its international center, library, administrative computer system office, research institute, and faculty office. A few years ago, he took early retirement so that he could become a freelance translator specializing in religious studies, but he has just started working as a high school librarian. In this way he is realizing his childhood dream of being surrounded by books at work while engaging in private research and translation projects on Buddhism at home. He has many hobbies, including bird watching, star gazing, photography, classical music, haiku and waka, and flower arrangement. Since childhood, he has also been obsessed with fine optical instruments, such as microscopes, binoculars, telescopes, and cameras. His favorite kanji compound is 大風呂敷（おおぶろしき). Although 風 means "wind," 呂 means "spine," and 敷 means "Japanese mattress," 風呂敷（ふろしき）means “cloth wrapper.” Adding 大 (big) yields “big cloth wrapper,” but 大風呂敷 usually means “big talk; to boast.” When Esho was a kid, a “big cloth wrapper” could very conveniently serve as Superman's cape, Sinbad’s turban, a ninja’s mask, Aladdin's magic carpet, and more. But more than anything, 大風呂敷 reminds Esho of his uncle, who used to tell him funny stories (half-true and half-false), just like the father in Chitty Chitty Bang Bang. Nicknamed 大風呂敷, this uncle was a little bit of a big mouth but also an all-embracing, warm-hearted person.